The National Chapter Of The United Family Rights Party- Nationwide and her state, regional, and State and Family Rights Party Chapters are open to all families. THE FIRST STEP OF JOINING YOUR STATE OR REGIONAL FAMILY RIGHTS PARTY CHAPTER IS TO JOIN THE NATIONA CHAPTER OF THE UNITED FAMILY RIGHT PARTY. THANK YOU FOR YOUR SUPPORT IN OUR MISSION AND CAUSE. THE NATIONAL DIRECTOR OF THE UNITED FAMILY RIGHTS ASSOCIATION MAY BE REACHED THROUGH WINDOWS MESSENGER AT THE EMAIL ADDRESS ABOVE. YOU MAY LEAVE US AN OFFLINE MESSAGE AND WE WILL GET BACK TO YOU AS SOON AS POSSIBLE. The National Chapter of The United Family Rights Party and The_Gateway_NationalChapterofTheUnitedFamily Rights Party invites all families to join our National Chapters. We offer supportive chapters, discussion groups, along with a True and Natural Mothers and Fathers support group and a The United Family Rights_ChristianFamilyRightsParty too. All Chapters require that new members complete a membership application. This is some of Support and Discussion Groups We have available to All Our Members. Please join The National Chapter and National Party and you are entitled to join any of the other support, educational, and discussion groups unless they are by invitation only. 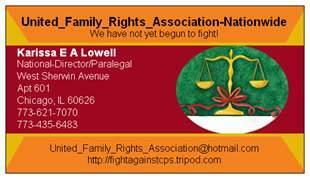 The National Chapter of The UFRA_ Share Your CPS Horror Story Support Group. This Support Group offers friendship, support, inspiration, for all parents that have lost their termination of parental rights due to CPS involvement. Click to join UnitedFamilyRights_ChristianFamilyRightsParty The Christian Family Rights Party is open to all Christian Families under siege by CPS and It is open to only those Christian Churches that adhere to Orthodox Christianity beliefs.